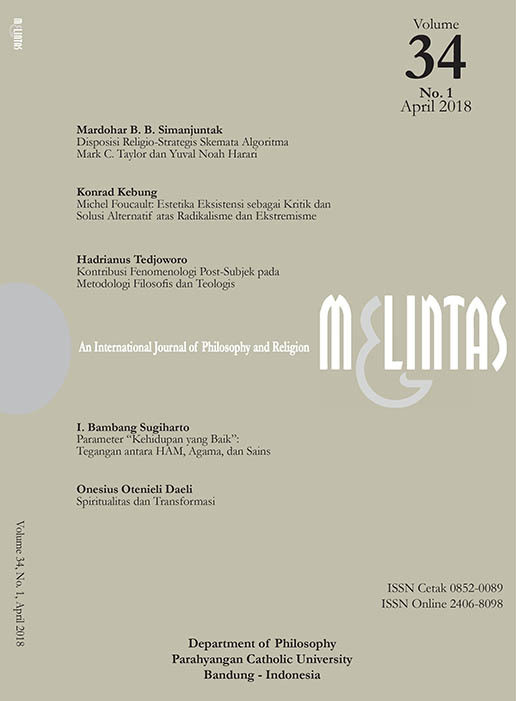 MELINTAS An International Journal of Philosophy and Religion, is published thrice yearly by the Faculty of Philosophy, Parahyangan Catholic University, Bandung, Indonesia. MELINTAS has been indexed by EBSCO since 2015. 'Melintas' is an Indonesian word, literally means "to move across" or "to pass over". The journal uses it in the sense of "moving across the border of horizons" and "passing over the limits of mind" so as to find ever new ideas and possibilities of understanding life and humankind. MELINTAS is licensed under Creative Commons Attribution 4.0 International (CC BY 4.0).